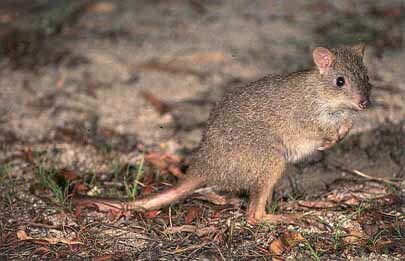 The northern bettong, a marsupial, is a small kangaroo weighing about 1 kg (2.2 lb). It prefers tall open forest and grassy woodland, generally above 400m (1300') elevation. Fruiting bodies of fungi (similar to truffles) are the most important food item. The northern bettong is nocturnal. It may require considerable movement during the night to locate the widely scattered fungi it prefers for food. It spends the day hidden in a nest on the ground, located within concealing vegetation or litter. The northern bettong is usually solitary. Its original distribution is not known. Until recently, it had been known from only six specimens, the latest collected in 1932, and was thought possibly to be extinct, but a population was discovered in the late 1970's in northern Queensland, Australia. As of 1996 its known range was restricted to three small isolated populations in northern Queensland within 80 km (50 mi) of one another. The reasons for its decline are not known with certainty; however, it has been proposed that the decline of non-flying Australian mammals with a weight such as the northern bettong's has been caused by certain environmental changes since European settlement. These include the diversion of environmental resources to humans and introduced species, and a reduction in vegetative cover by exotic herbivores and changed fire regimes (Burbidge & McKenzie 1989) . The greatest current threat is habitat loss due to land development. Its original distribution is not known. Previously it been observed in the Dawson Valley area in central coastal Queensland (1884) and near Ravenshoe (possibly as late as the 1920's). Until recently, it had been known from only six specimens, the latest collected in 1932, and was thought possibly to be extinct, but a population was discovered in the late 1970's in northern Queensland, Australia. As of 1996 its known range was restricted to three small isolated populations in northern Queensland within 80 km (50 mi) of one another: in the Lamb Range (where a survey in 1994-95 found it to be present in nearly half of the live-trapping sites surveyed (Laurance 1997) ) and in the areas of Mt. Windsor and Carbine Tableland (Maxwell et al. 1996) . It has been proposed that the decline of non-flying Australian mammals with a weight such as the northern bettong's has been caused by environmental changes since European settlement which have emulated an increase in aridity by reducing the environmental productivity available to vertebrates. These include the diversion of environmental resources to humans and introduced species, and a reduction in vegetative cover by exotic herbivores and changed fire regimes (Burbidge & McKenzie 1989) . Current threats include habitat loss due to land development, especially in the Lamb Range area, and possibly competition with feral pigs for the same fungal fruiting bodies utilized for food by the northern bettong. About 1.2 kg (2.6 lb). The northern bettong apparently prefers wet and mesic sclerophyll forests and open woodland with a grassy understory. It occurs in areas with less fertile soils (e.g. derived from granite) rather than areas with rich soils. This may be because the fungal fruiting bodies which constitute an important part of its diet are most abundant in soils with low fertility. It is generally found above 400m (1300') elevation. The northern bettong apparently breeds throughout the year. As with other kangaroos, a young northern bettong is carried in a pouch until it is able to follow its mother around. Fruiting bodies of fungi (similar to truffles) are the most important food items. Other items include grass roots, tubers, lilies, herbs and sedges. The northern bettong is nocturnal. It may require considerable movement during the night to locate the widely scattered fungi it prefers for food. It spends the day hidden in a nest on the ground, located within concealing vegetation or litter. The northern bettong is usually solitary.